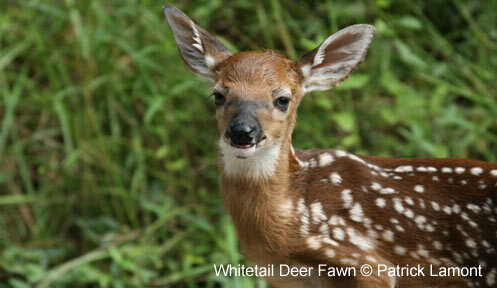 If you see a fawn, or any young wildlife, and suspect it has been abandoned, DON'T pick it up. Its best chance for survival is probably in the wild. 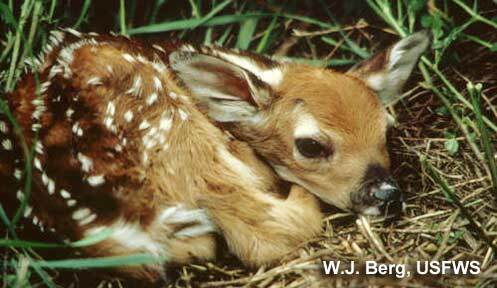 May and June are the time of year when deer fawns are born in New Hampshire. Each year, people in the state are lucky enough to view and photograph these beautiful young animals…and that is where these fortunate encounters should end. People often see young fawns alone that seem weak and motionless, and fear the worst. Has the mother died? Has she abandoned her fawn? In most cases, the doe is not far off, waiting to return to feed her newborn fawn. Seeing a fawn (or a moose calf) alone does NOT mean it has been abandoned. It is normal for a doe to leave her fawn alone for several hours at a time while she is off feeding. She may not return until nightfall to nurse her fawn. This actually helps keep the fawn safe from predators. Fawns (only 4-10 lbs. at birth) are born with little scent and a spotted camouflage coat. They are not very mobile, though. They will bed down in high grass or thick vegetation and remain motionless, trying to avoid detection from predators. The doe, on the other hand, can be easily detected by predators due to her scent and large size, so she spends time away from her fawns to help keep them hidden. Does may only visit their fawns 3-4 times a day to quickly nurse before leaving again for hours, although usually not straying too far. Fawns mature quickly and are not helpless for long. After about a month, they can elude most predators. By 2-3 months, they are weaned and rely on vegetation, not milk, for food. Remember -- the best chance a young wild animal has to survive is in its natural environment under the care of its mother. 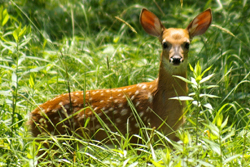 If you see a fawn (or any other young wildlife) and suspect it has been abandoned or orphaned contact NH Fish and Game by emailing wildlife@wildlife.nh.gov or calling (603) 271-2461 and make a report. Fish and Game staff can assess the situation and help determine the best course of action. Do not repeatedly visit the fawn. If the doe is close by, she probably will not return until people have left the area and she feels safe. Keep your distance and give the doe time to return and move her fawn to a new location. Never attempt to feed fawns. Improper foods like cow’s milk lead to severe diarrhea (scours), and often result in the fawn’s death. Moose calves should also be left alone. Cow moose (and other wildlife) will aggressively defend their young if they feel threatened. Never take in wildlife. Only qualified people with special rehabilitator permits, issued through NH Fish and Game, may take in and care for injured or orphaned wildlife. Improper care of injured or orphaned wildlife often leads to their sickness or death. Unless you have rehabilitator credentials, it is illegal to have in your possession or take New Hampshire wildlife from the wild and keep it in captivity. For a full list of licensed wildlife rehabilitators, go to wildnh.com/wildlife/rehabilitators.html.